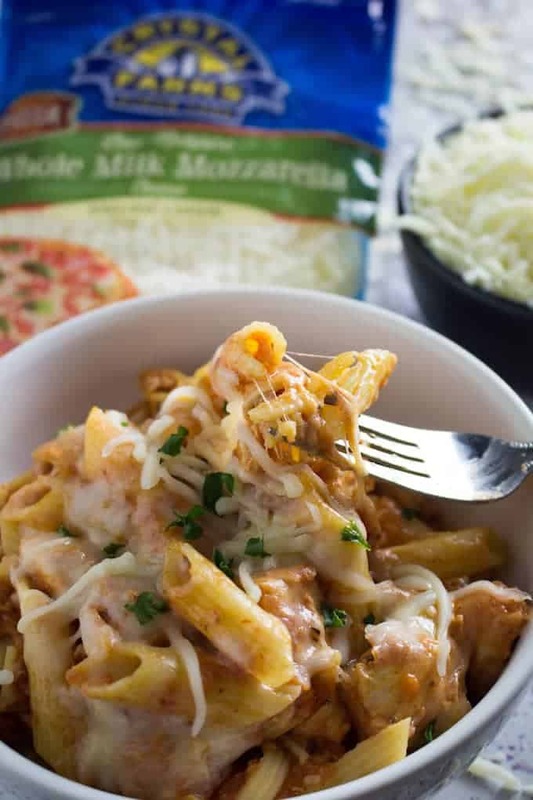 Crock Pot Chicken Parmesan is a simple gluten free dinner that’s perfect for a weeknight. 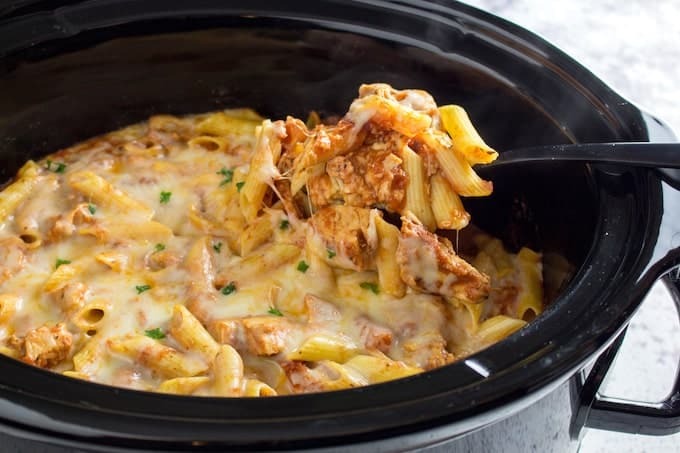 Just set the chicken and marinara sauce in the slow cooker and forget about it, then add cheese and pasta just before serving. It’s minimal effort, with a ton of flavor! This post is sponsored by Crystal Farms Cheese® but the content and opinions expressed here are my own. Crock Pot Chicken Parmesan is one of my favorite gluten free weeknight dishes. It’s super easy to make because the slow cooker does most of the work. I set this on low in the morning, then go about my day. Around dinner time, the house smells like you spent all day making a super-amazing Italian dinner. My family loves crock pot chicken parmesan, and I think yours will, too! 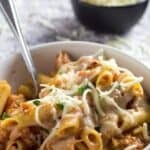 Slow Cooker Chicken Parmesan is ready in 2 easy steps! This slow cooker chicken parmesan only has two steps, really. First you slow cook the chicken in marinara sauce all day long. 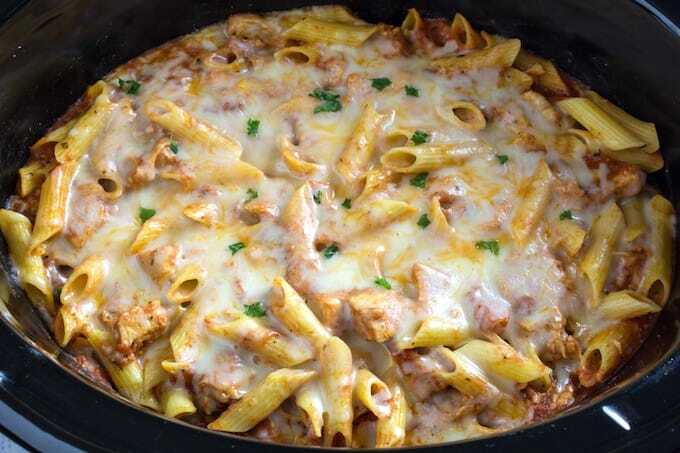 Once it’s basically falling apart with a fork, you cook some penne pasta until it’s al dente. Then you mix it all together with cheese, and put the top back on for a few minutes to let the cheese melt. 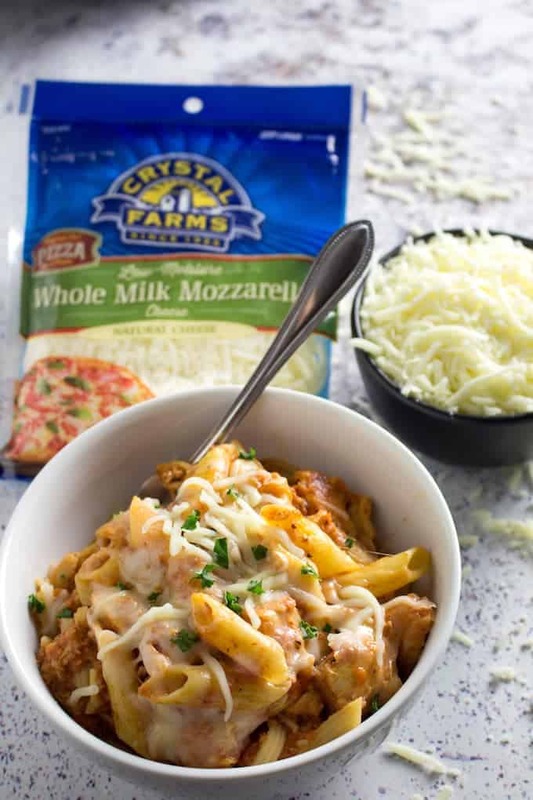 By the time you’ve gathered everyone and finished setting the table, the cheese will be melted and your slow cooker chicken parmesan will be ready to eat! 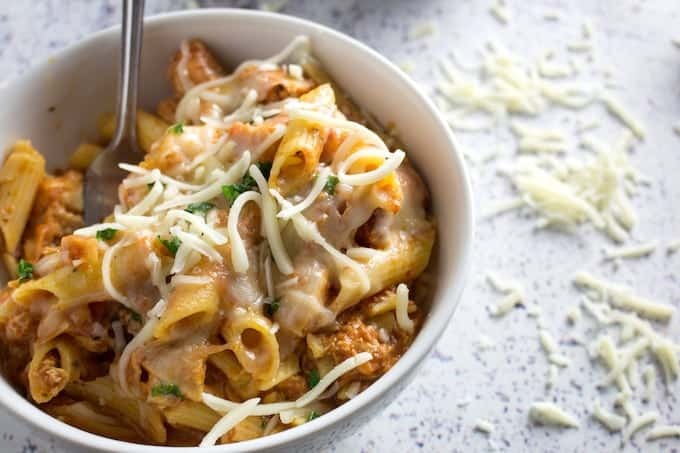 This slow cooker chicken parmesan is basically another version of my one pot chicken parmesan and pasta. But this version is made for people who have really busy days, so they can set it and not pay attention again until it’s almost time to eat. I’d make slow cooker chicken parmesan any day, though! It’s Also Gluten Free Chicken Parmesan! Not only is crock pot chicken parmesan ridiculously easy to make, but it’s also gluten free! Normally with chicken parmesan you need to worry about breading and other glutinous things. But with this gluten free chicken parmesan recipe, we throw the whole plain chicken breast into the marinara sauce as-is. No flour, no breadcrumbs, no problem. Can you use gluten free breading and fry your chicken first? Sure, it’ll probably taste great. But, it’ll take a lot more work. And easy gluten free chicken parmesan is the goal here today. 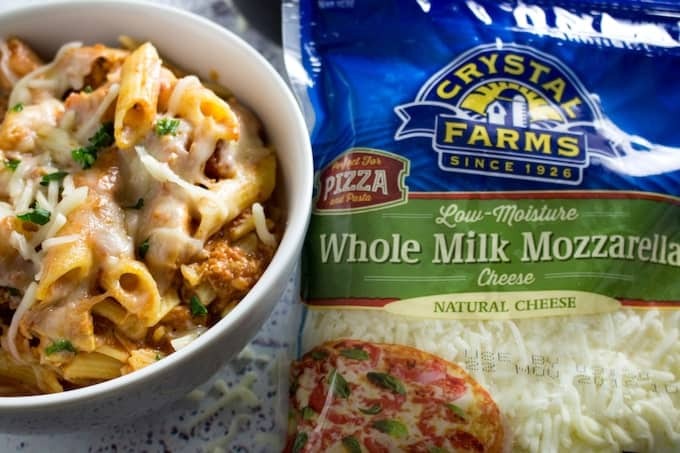 My sponsor today is Crystal Farms® Shredded Whole Milk Mozzarella Cheese. I love this because it’s a natural product with few preservatives, and all of their cheeses are gluten free! You can find it in the refrigerated dairy section. Visit Crystal Farms for more recipes! You might be asking, is mozzarella cheese gluten free? Have you wondered, is mozzarella cheese gluten free? The short answer is, yes, mozzarella cheese is gluten free. That being said, if there’s anything added to the cheese afterwards, like spices or sauce – or if the cheese is being handmade in a restaurant where cross contamination can be present – then you need to be wary. But mozzarella on its own is one of my favorite gluten free food groups. 5 Easy Slow Cooker Chicken Recipes! Slow Cooker Creamy Chicken and Wild Rice Soup – A classic dish made incredibly easy! Creamy soup with wild rice, and tender chunks of chicken and veggies. Delicious! Slow Cooker Butter Chicken – This is one of my all-time favorite dishes! Chicken thigh meat covered in a spiced sauce, and served on top of basmati rice. Slow Cooker Teriyaki Chicken – I love teriyaki, and I love this dish even more because it’s a gluten free teriyaki sauce! Serve this one over jasmine rice with some freshly chopped green onions on top. Slow Cooker Sweet & Sour Chicken – This dish is the perfect way to use up leftover pineapple or bell peppers. Sweet, spicy, and oh-so-nicey. Slow Cooker Chicken Enchilada Soup – Another great weekday dish, this enchilada soup is made from scratch and offers all of the flavors you love about enchiladas! 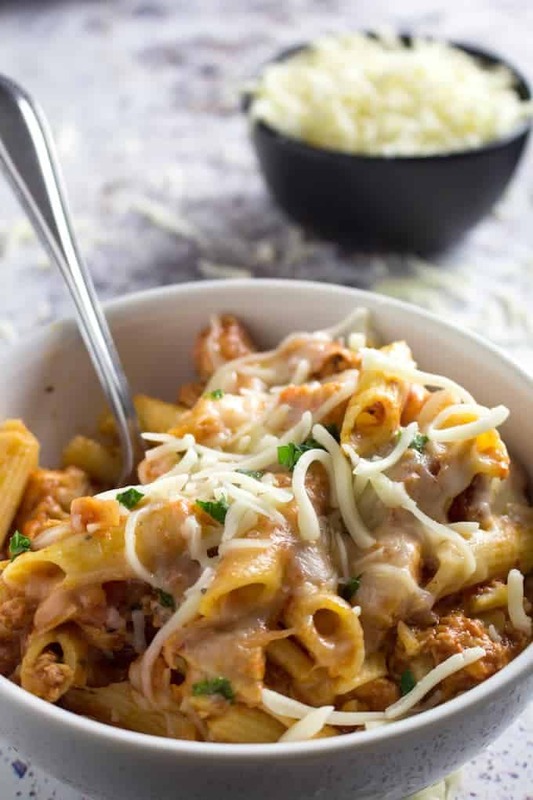 Crock Pot Chicken Parmesan is a simple gluten free dinner that's perfect for a weeknight. Just set the chicken and marinara sauce in the slow cooker and forget about it, then add cheese and pasta just before serving. It's minimal effort, with a ton of flavor! Place chicken breast, marinara sauce, garlic, salt, and pepper into slow cooker. Cover and cook on HIGH 4 hours, or on LOW 8 hours. Cook gluten free penne until al dente. Once done, drain and add to slow cooker. It's important to only cook the pasta until al dente, or it will get mushy and fall apart. Cheesy Taco Zucchini Boats - Gluten Free! Previous Post: « Chicken Broccoli Alfredo Bake – Gluten Free!